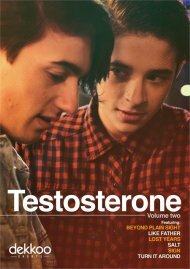 The first in a collection of the hottest gay shorts from four corners of the world, Testosterone: Volume One will set your pulse racing. From the intense effects of first love, to a deliciously campy tale of a camping trip gone horribly wrong, this collection of four brilliant shorts is sure to stir! This collection includes End of My World, The Surf Report, It Gets Better, and Killer Friends. Length: 1 hrs. 7 mins. "Testosterone" is the first in a collection of gay shorts from four corners of the world. We do not usually get a chance to see many of these shorts and I am so glad that Dekkoo and TLA Releasing have decided to bring the to us. This collection has a films that activate the mind and the body. "The End of My World"
After a few years of their relationship, Eryk leaves Filip and disappears without a trace. Filip is unable to handle the new situation and convinces himself that the end of the relationship is also the end of his world. He has put aside his life waiting for Eryk to contact him. What Filip doesn't know yet is that a new day is going to bring many reflections, changes and groundbreaking decisions. Kamil Krawczycki directed. Director Courtney Powell brings us a ghostly love story about two men looking for answers where ocean meets sky and city meets wild in Rockaway Beach, NY. After drinking heavily and getting stuck in a YouTube hole of "It Gets Better" videos, a man reflects on his life and decides to tell his own story. Stephen Risica directed and is for anyone who has ever had to conquer their own demons.